Thekkady is one of the major destinations of the state of Kerala, the God�s own country. Due to its unmatched natural beauty and serenity, this small town is visited by a large number of tourists every year. The town also houses one of world�s most fascinating natural wildlife sanctuaries. Thekkady is also the major base point to access some of the other exotic sites in Kerala as well as in Tamil Nadu. A visit to Thekkady also provides you the opportunity to see wildlife at close ranges, besides the varied vegetation and a wide variety of birds. Lying at an altitude of 700-1900 m above sea level, Thekkady has a cool and comfortable climate. Out here, you can also go for treks and mountain walks. Thekkady has a lot to offer you in sightseeing. The name Thekkady, for those who have already visited this place, brings to mind images of elephants, unending chains of hills and spice-scented plantations. Moreover, the flora and fauna of the Periyar wildlife sanctuary is absolutely thrilling. The wildlife sanctuary here is the natural habitat of a wide variety of animal species. The Periyar Lake is a paradise for the nature lovers. It gives you an opportunity to observe the wild animals roaming in the jungle. The lake is also a birdwatcher�s delight. 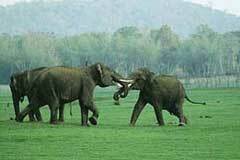 The greatest attraction of Periyar Lake, however, is the herds of wild elephants that come down to play in the lake. Moreover, the Sanctuary Watch Tower situated in the forest interior gives you a panoramic view of the park. Thekkady has innumerable excursion destinations for you to visit. To start with, Peermede, located at a distance of 44 km is an important site to visit. Apart from Peermede the palm-fringed backwaters of Kottayam and Kumarakom make both these places the must visit excursion points. Moreover, the exciting boathouses here also give you once in a lifetime experience to roam on a fully furnished �house� on the water. Madurai, located in the nearby state of Tamil Nadu is another interesting place to visit. Known as the temple city of India, Madurai also holds importance as a centre for learning. Kumily (a plantation town), Murikkady (known for its cardamom, coffee and pepper plantations), Pandikuzhi and Mangla Devi temple are some of the few more places to visit during your excursion from Thekkady. Located by the side of the river Periyar, the Periyar Wildlife Sanctuary is the main attraction of Thekkady. Spread over an area of about 777 sq km with about 360 sq. km of which is thick evergreen forest, the sanctuary was declared a Tiger Reserve in 1978. However, the Periyar Wildlife Sanctuary can also be recognised as one of the natural treasure houses of some of the rare species of flora and fauna. The flora of the park includes over 1965 flowering plants, 171 grass species, 143 species of orchids and the only South Indian conifer Podocarpus Wallichianus. Apart from the tigers, the fauna of the park includes wild elephant, gaur, sambar deer, wild boar, Nilgir Tahr, lion tailed macaque, bonnet macaque, Malabar giant squirrel, flying squirrel, tiger, jungle cat, sloth bear, hornbill, stork, woodpecker, kingfisher, raptor, cormorant, grackle, darter, cobra, viper, krait, monitor lizards, frogs, toads, masheer (famous and endangered game fish of India) and otter. The lake of the Periyar wildlife sanctuary makes an important site to visit in Thekkady. This splendid artificial lake formed by the Mullaperiyar Dam across the Periyar River adds to the charm of the park. A wonderful palace located in the heart of the Periyar Lake attracts a lot of visitors. The greatest attraction of Periyar Lake however is the herds of wild elephants that come down to play in the lake. Periyar is the only sanctuary in India where you can have the unique experience of viewing wildlife at close quarters form the safety of a boat on the lake. The Watch Tower makes another important tourist spot to visit within the park. You can also have a wonderful view of the surrounding areas from here. The tower is maintained by the Forest Department and it is one of the best places to witness the animals, as the tower overlooks water holes in buffer zone. Wear proper boots and outfits to avoid scars and insect bites. 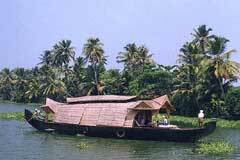 also visit Kottayam, it being of great religious importance for the Hindus. Kottayam houses some of the revered temples of southern India like Thirunakkara Mahadevar Shiva Temple, Valiapalli and the Cheriapalli. Moreover, Kottayam also has the famous Thazhathangadi Mosque and the wonderful Good Shepherd Church that add to the beauty and importance of the place. Located at a distance of 128 kilometres from Thekkady, Kumarakom is a must visit place of Kerala. The main attraction includes the Kumarakom bird sanctuary set in 14 acres of woods. The sanctuary has a large variety of migratory birds and offers a visitor the options of sailing in its backwaters. Sailing in the boathouses out here is a once in a lifetime experience. Poled by local oarsmen, the houseboats are generally furnished with a living room, a bedroom, a private sit-out for the passengers and some of the water related hobby options. Kumarakom is also famous for its old churches and the exceptionally popular ayurveda treatment. A plantation town easily accessible from Thekkady, Kumily makes a must visit excursion from Thekkady. Kumily is located just at the outskirts of the Periyar wildlife Sanctuary. Apart from being an important tourist destination, Kumily is also an important spice trade centre. Madurai is called the temple city of India, which makes it one of the most visited religious destinations of southern India. Located at a distance of about 174 km from Thekkady, this must visit excursion site is situated on the rocky banks of the river Vaigai in the state of Tamil Nadu. Madurai is also the modern industrial city of the state. The political capital of the Pandyan and the Nayakan dynasties, Madurai has also been the centre for learning and the heart for South Indian culture and tradition for the last 2,500 years. The magnificent gopurams of the Meenakshi Temple are the first and main attraction of the city. Spread across six hectares of area, the temple is situated in the middle of the town. Apart from the massive Meenakshi temple, the Mariamman Teppakulam, Tirumalai Nayak Mahal, Gandhi Museum, Thirupparankunram, Azhagar Koil and Koodal Alagar Temple are some of the other important sites to visit in Madurai. Moreover, as Madurai makes a good base point to visit some of the exotic destinations nearby, you can also decide on spending some more time here to complete your visit to the southern India. Just 15 kilometres from Thekkady, Mangla Devi is an interesting place to go out on an excursion. Located at an elevation of 1337 m above sea level, the temple is built in the traditional Kerala style of architecture and holds ample importance as a Hindu pilgrimage site. From the temple, you can also have a panoramic view of the slopes of both eastern and western ghats and of some hill villages of Tamil Nadu. Located at a distance of just 5 kilometres from Thekkady, Murikkady is another important site to visit. Murikkady is particularly famous for its panorama of cardamom, coffee and pepper plantations. A must visit to include in your excursion itinerary. Another picturesque spectrum of nature�s flora, fauna and gurgling streams is Pandikuzhi. Sandwiched between Chellarkovil and the Tamil Nadu border, it makes an important excursion point for every tourists visiting Thekkady. A considerable number of visitors come to this place every year. Being an ideal picnic, trekking, and photographic spot, it is also the favourite day and weekend destination for the localities as well. Located at a distance of 44 kilometres from Thekkady, Peermede is an important excursion destination one should not miss. Peermede is situated at an altitude of 915 -1100 m above sea level and is a famous plantation town. The name of the town has been given after Peer Mohammed, a famous Sufi saint who was also a close associate of the erstwhile royal family of Travancore. Peermede is also known for its tea, cardamom, rubber and coffee plantations interspersed with sculptural rocks, meadows and mist-cloaked hilltops. Moreover, Kuttikanam, (a place for adventure tourism and trekking), Thrissanku Hills (a haunt of trekkers and picnickers), Mausoleum of the Sufi saint, the summer palace of the royal family, residence of the Diwan, and the many lofty peaks and streams are some of the other major attractions of this place. Click below for other Indian Tours.